MTCO digiMAX TV Service | digimax | Your Cable TV alternative! Local service and support in Metamora, Germantown Hills, Marseilles, and Washington Illinois! Bundle your services in Marseilles, Germantown Hills, Metamora and Washington, IL! up to 0250 Mbps add $10/ mo. up to 1000 Mbps add $40/ mo. That's 35 more HD Channels than cable! 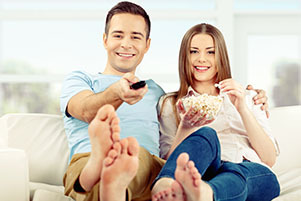 Instant access to over 7000 Video-On Demand TV Shows & Movies! Caller identification on your TV before the phone rings! Call Today and SAVE with bundled, no gimmick pricing! FREE HD Set Top Box to first TV! and 50 Stingray music channels! Pause live TV, playback & record. Record in 1 room & watch in others with 1 DVR. Manage recordings from 1 room or your smart phone & watch from any set top box with 1 DVR. Add premium channels and more to your package -- details at our channel lineup page. * Limited time offer. 1-yr. agreement required for all discounts. Not available in all areas. Monthly rates are standard, non-promotional rates. Free installation up to 4 TV's, $80 per TV after first 4. More complex installs may require additional fees. A high-definition TV is required to view HDTV signals. All free and leased installed MTCO equipment (set top boxes, adapters, etc.) remain property of MTCO and must be returned at cancellation or unreturned equipment fee will apply. Location may determine max number of TV's allowed. Unlimited long distance calling for residential service and continental U.S. only. Cannot be used for business purposes such as telemarketing, broadcast faxes, etc. MTCO may restrict or cancel service if inconsistent with residential voice usage. Actual speeds may vary and are not guaranteed. Internet service data plan includes 1 Terabyte (that's 1000 GB!) per monthly billing period. For more details, see FAQ at www.mtco.com. Federal, state and local taxes, governmental regulatory fees and surcharges, if any, are additional. Other charges, conditions, requirements and restrictions may apply. Offer may not be combined with any other offer and is non-transferable. Customers can choose digiMAX Wi-Fi service for $8/mo (router included) or provide 3rd party router for wireless internet.